A considerable surprise awaits those who think of mushrooms as bland and brown and white. The fungal kingdom boasts over 1,500 identified species of mushrooms in the Bay Area, coming in every size, shape and color imaginable. Some even glow in the dark. There is a miniscule mushroom (Strobilurus trullisatus), about 1 cm wide, that grows only on Douglas fir cones. There is a Honey Mushroom fungus (Armillaria ostoyae) in the Malheur National Forest in Oregon that is perhaps the largest living organism on the planet—estimated to be 3.5 miles across; its major portion lives underground and its fruiting mushrooms are visible above ground as just a tiny fraction of the organism. Mushrooms come in fantastic shapes, including fans, trumpets, sea coral and even an upside down basket. Regardless of their shape, size or color, all mushrooms are members of the Fungus Kingdom; however, all fungi are not mushrooms. While the term mushroom commonly refers to the visible fruiting body of a fungus, the complete organism includes an unseen network of filaments called the mycelium that is the vegetative part of the fungus. Mushroom-bearing fungi can be seen growing on the ground or directly on plant material, and all are dependent on plants for their survival. No less amazing than their appearance is the work mushrooms do in our environment. Mushroom fungi are ecologically linked to the plant kingdom and function in three ways: saprophytic, parasitic or symbiotic. The majority of mushroom-bearing fungi are saprophytic, meaning they live on dead or decaying plant matter. They break cellulose and lignin back down into simple compounds that can be incorporated easily into the soil. They are essential recyclers in our ecosystem. 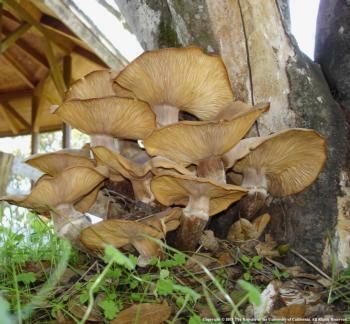 All commercially cultivated mushrooms such as the brown and white Buttons, Portabella and Shiitake fall into this saprophytic category. At the opposite end of the spectrum from the parasites, symbiotic mushrooms nurture plant life by connecting their mycelium with the rootlets of living plants. They assist the host plant with nutrient absorption, while extracting carbohydrates for their own nourishment. A prominent symbiotic mushroom is the infamous Death Cap (Amanita phalloides). Deadly to humans (accounting for 95% of mushroom poisoning in California), it is beneficial to its favored hosts in California—live oak trees. Many less ominous mushrooms occupy this category: common in Marin are Suillis and Pine Spike both symbiotic with pine trees; Birch Boletes with birch trees; and Manzanita Boletes with madrone trees. Wild mushrooms such as Chanterelles and Porcini also require this mutual relationship with plants. There is no way to cultivate them. Experts must gather them in the woods. When we pay attention to mushrooms, they remind us that their edibility has nothing whatsoever to do with how they function in nature. Some like the Death Cap are deadly to humans while nurturing plant hosts, while others are tasty and safe to eat yet deadly to their plant victims.